The Love Affair collection is a celebration of 90 years of Bang and Olufsen affection towards design, craftsmanship, and moments of magic created by great music and movies experienced on second-to-none equipment. 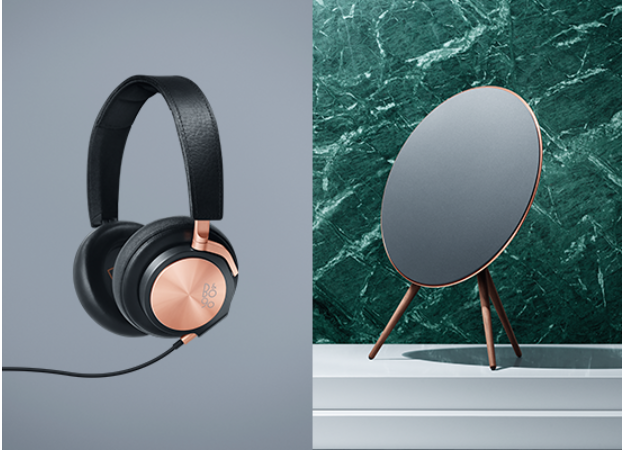 Peter Bang and Svend olufsen began their quest and the Love Affair collection perfectly captures the mood and style characterised by elegance, enticement, and energy. The original A9 speaker comes with a rose gold touch on the aluminium ring, iron grey front cloth and elegantly crafted walnut legs. Meanwhile the H6 headset has the rose gold metal crafted beautifully on the jet black leather. This makes you enjoy the premium over ear headphones with excellent sound and style. It focuses on natural and authentic sound performance with clear midrange and balanced bass and treble.